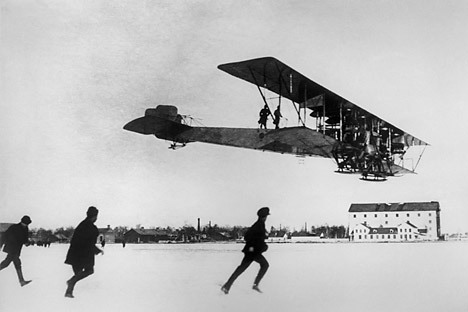 The first Russian built Ilya Muromets S-22 aircraft made its maiden flight near St Petersburg a hundred years ago. The Ilya Muromets S-22 aircraft, which was huge for its time, had a wingspan of 31 meters and a length of 19 meters. This was the world’s first production four-engine aircraft and served as the prototype for many of the 20th century’s four-engine airliners. All the principal components were made of wood. The aircraft was manufactured at the aviation department of the Russo-Baltic Carriage Plant under a collective led by pilot and designer Igor Sikorskiy. Konstantin Pakhalyuk, Leading Specialist of the Scientific Department of the RVIO Rossiyskoe Voyenno-Istoricheskoe Obshchestvo (Russian Military History Society) explained that the first flight of the S-22 was a training flight. Two days later, however, on December 12 the aircraft carried a load of 1.1 tons, which for that time was a huge record. New records were to follow: February 12, 1914, the Ilya Muromets took 16 passengers as well as a dog, nicknamed Shkalik, into the air. A long-range flight from St. Petersburg to Kiev was completed on June 17, which was celebrated as a real triumph. Igor Sikorskiy was then just 24 and flew his aircraft himself on the majority of flights. “Tsar Nicholas II noticed his success even back then,” said Pakahlyuk. The State Duma awarded the designer a huge sum of 75,000 tsarist rubles’ (in today’s money that would be $2,296.50 or 1,404.75 British pounds). Between 1913 and 1918 several production variants of the Ilya Muromets were produced at the same time: the aircraft was designed as both a bomber and a passenger aircraft. The total number produced, according to estimates by historians was between 60 and 80 examples. For the first time in the history of aviation, the Ilya Muromets featured a luxury saloon separate from the cabin, with bedrooms, heating, electric light and even a bathroom. If history had turned out differently the Muromets aircraft would have laid the foundations for regular passenger aviation in Russia. However the onset of the First World War sealed the fate of the project. “A decision was taken immediately after the flight from St. Petersburg to Kiev to equip the military with this aircraft,” Pakahlyuk said. The Muromets operated in the bomber and reconnaissance role. It was fitted with cameras for aerial photography as well as machine guns to repulse an enemy. The Muromets had powerful defensive weaponry, almost devoid of blind spots. It was this defensive capability that earned the Muromets aircraft the nickname of ‘yozhi’ (the hedgehog). In the period between October 30, 1914 and May 23, 1918, there were 26 aircraft of this type that were either lost or written off. Furthermore only one of these was shot down. The others became unserviceable due to mechanical failures, pilot error or weather phenomena. The final combat sortie for an Ilya Muromets aircraft took place on November 21,1920. Following the Soviet-Polish war of 1919 to 1921, several Muromets aircraft operated with the first cargo airlines, however they were withdrawn from these flights due to their deteriorating condition and the fact that the service life of the engines had come to an end. One of the last production aircraft was handed over to the School of Aerial Gunnery and Bombing in 1922 as a trainer. Around 80 training flights were undertaken in this aircraft in the space of a year. After this the Muromets aircraft never took to the air again. Based on materials from Itar-Tass, State History and O Rossii websites.